Contains the active substance human chorionic gonadotropin (hCG), which is a polypeptide hormone that is produced by the syncytiotrophoblast, a component of a fertilized egg after conception. It is a polypeptide hormone that plays an important role in the normal development of the egg in the female ovary and stimulates the release of the egg during ovulation. 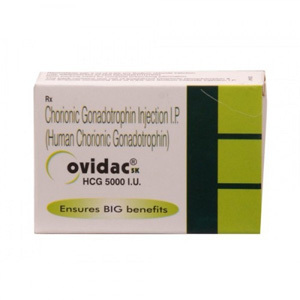 HCG Ovidac 5000 IU has a wide role in the treatment of infertility in women and increases the number of spermatozoa in men. It is available as a pack containing sterile lyophilized powder and solvent (bacteriostatic water). 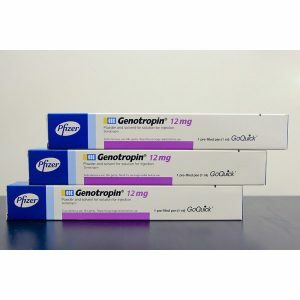 Human chorionic gonadotropin is a hormone that is prescribed for infertility, increases the number of sperm and pituitary disorders. How does Ovidac 5000 IU work? HCG Ovidac 5000 IU is a water-soluble glycoprotein derived from the urine of pregnant women. HCG consists of two units of alpha and beta blocks. One injection of hCG causes ovulation between 38 and 40 hours. 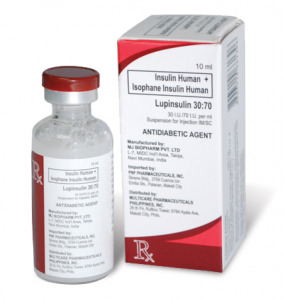 HCG is an analogue of luteinizing hormone (LH). Luteinizing hormone together with follicle-stimulating hormone plays an important role in the development and maturation of the normal ovarian follicle in the middle of the LH cycle initiates ovulation. HCG plays the same role of LH in the body and stimulates the process of ovulation in an unborn woman. HCG stimulates the corpus luteum of the ovaries to produce progesterone.